AmPhiElec PWR is a water-soluble electrolyte concentrate that is easily used with drinking water for poultry. AmPhiElec PWR is a balanced mix of electrolytes that helps in both the prevention of dehydration and in reversing its effects in poultry. 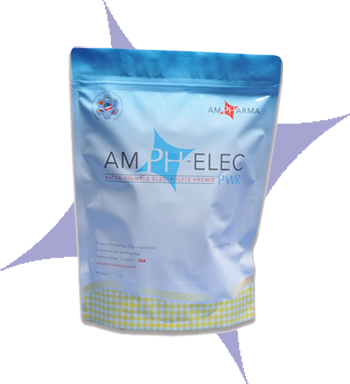 AmPhiElec PWR, with its content of essential trace elements in chelated form, aids in maintaining and/or restoring the physiological levels of electrolytes needed by animal cells to perform their normal biological functions. AmPhiElec PWR contains essential chelated amino acids that are necessary for a healthy immune system by aiding in the processes of activation of lymphocytes, NK cells, and Macrophages. AmPhiElec PWR also helps in the prevention of amino acids deficiency in birds, and accordingly, helps promote a healthy immune system that fights infectious disease through the production of antibodies, cytokines, and other cytotoxic substances. AmPhiElec PWR is a useful aid in relieving stress and a bird's fatigue after vaccination. AmPhiElec PWR helps in all immuno-suppressive disease such as: Gumboro, reticuloendotheliosis, reo and other infectious diseases. AmPhiElec PWR also aids in cases of anemia, avian leukosis, mycotoxicosis, and other various acute and pre-acute diseases, such as avian flu. AmPh1i-Elec PWR is beneficial in relieving stressful conditions such as heat stress, overcrowding, and transportation, during and after molting. AmPhiElec PWR is a good source of minerals that help during the peak of egg production. Add 500-700 grams of AmPhiElec PWR for each 1,000 liters of drinking water for five days. Potassium Bicarbonate, Calcium Acetate, Sodium Diacetate, Sodium Acetate, Sodium Bicarbonate, Copper Chelate*, Manganous Chelate*, Zinc Chelate* and other patented mix using Glycine as a Chelating Agent.